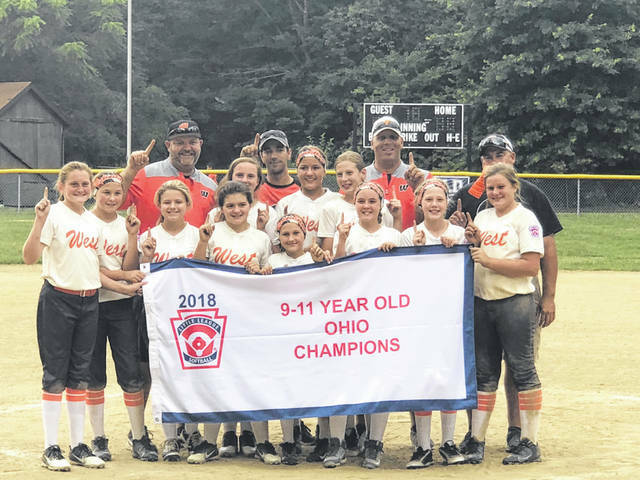 Softball has been sweeping the news as of late for area teams, as the West Portsmouth 9/10 year old and the 11U little league softball teams both traveled to Tallmadge, Ohio this weekend and competed in their state tournaments. The 11U team won the state championship in their double elimination tournament by defeating host Tallmadge in the championship game Sunday afternoon by a final score of 10-3. Heading into the bottom of the fourth inning, the game was tied at 3-3. That was until West opened up the game after an explosive half inning that resulted in seven runs, extending their lead to 10-3. “We just hit the ball hard today” said head coach Shad Ford, “We hit the ball hard and right at them, they couldn’t field it and that was a big difference. Spots one through nine hit today and hit it hard.” In order to reach the championship game, West had to beat Cuyahoga Falls South 15-0 early Saturday morning, before beating Fairland 5-1 later Saturday evening. Ford could not have been prouder of his team and their play over the weekend, “I’m just excited for the girls, and all the work they put into this season.” Ford’s assistants on this year’s state champion 11U team were JP Pickelsimer, John Rollins, and Rodney Moore. There will be a parade, or some form of celebration to welcome back the 11U team, and possibly the 9/10s team if they are able to go all the way as the 11U team did. Yet the parade will not be until the 9/10s season is over, as the 11U team waits until they are finished for the year. West’s 9/10s team split their games in the double elimination state tournament this weekend in Tallmadge. Their first game was a decisive win against Ashtabula 10-0 Saturday morning. In their victory, Maycee Ford and Maci Bradford combined for a no hitter while Kate Entler went three for three at the plate. This result gave head coach Brandon Entler’s team the rest of the day off to prepare for their opponent the next morning, Canfield. West fell to Canfield Sunday morning by a score of 3-2. In that game, Bradford and Ford combined for nine strikeouts and only one earned run given up. West was able to get four hits on the day, two from Maci Bradford, and one each from Erica Whisman and Kaylyn Darden. Entler’s team will face the winner of Payo and Symmes Valley in their next game of the state tournament on Monday at 6 p.m. When asked about what his team can improve on for tomorrow’s elimination game, Entler said baserunning. 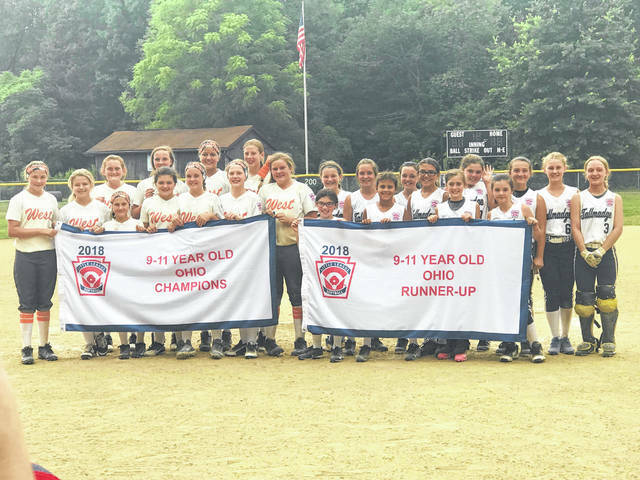 “We ran ourselves out of the game” said Entler, “We made some crucial errors on the base path, I don’t know if it had something to do with us playing at 8:30 a.m. We played good enough to win, just made some crucial baserunning mistakes.” Entler and Ford’s group of girls celebrated the 11U team’s state championship by having a cookout where all the players, coaches, and family could gather together.